A couple things learned today: 1) I realized how long it had been since I last blogged from the thin layer of lint that covered my Nikon camera, 2) It occurred to me that maybe I should be keeping the camera in a protective case to ward off against said lint, and 3) Maybe I should be storing the camera in a place where lint is less prevalent, i.e. NOT the laundry room. And uh no, I haven’t moved it yet. 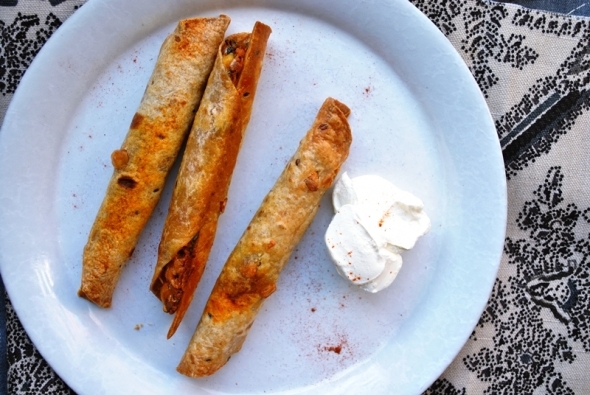 Something worth getting the duster out though are these veggie taquitos– stuffed with a filling of mashed sweet potato and black beans and suspended in swirls of cream cheese and spinach, these little babies pack a punch of flavor. A new spice I’ve been playing around with is New Mexico chile powder, a dry ground form of ají colorado basically, and it seems to have a brilliantly similar effect to that of the pureed version, but with much less hassle (always a plus in my book! ), and along with it’s sidekick ají amarillo chile powder, it’s what I added in the taquitos today. It’s the slight warmth from the chile that makes this dish I think, that, and the natural sweetness you get from the sweet potatoes on top of the lovely lusciousness gained via cream cheese; she’s a trifecta of harmonized flavors that are really just meant to be together. *You can typically find these chile powders at Latin American markets, gourmet spice vendors, and of course, online. Note: You will most likely have a little bit of filling leftover– you can either keep rolling and bake on second baking sheet or do what I do and just throw it in a container in the fridge and eat it by the spoonful as a snack for midnight. Your call. // Set a large fry pan on the stove over medium high heat with just canola oil to coat. Toss in half of the sweet potatoes, you’ll work in 2 batches, season with salt and pepper, stir and put a lid on it to help cook faster, about 5-7 minutes. Take off the lid and check for softness. Mash with a fork and put in a large bowl. Add more oil to the pan and throw in the remaining sweet potatoes, repeating process. Put into the same bowl. Add another dribble of oil to pan and toss in minced garlic, allowing to fry slightly, about half a minute until fragrant. Throw in the black beans and stir together. Season with salt, pepper, chile powders, paprika, cumin, and oregano, stirring again. Add the water, mash black beans with a fork and throw in all of the baby spinach– it will be a heaping mess and you’ll think it’s way too much but after it wilts it’ll be but a scant cup or so– and cover with a lid, letting greens soften, about 4 minutes. Take the lid off and stir again to combine. Put mixture into bowl of sweet potatoes. Add in the softened cream cheese and fully combine with a spoon. Taste for seasoning, adding more salt and pepper to suit personal preference. Set aside. Put a small fry pan over medium heat and spray with oil, just a thin sheen is perfect. One by one, take your tortillas and fry them in the pan, turning them over until slightly golden, soft and pliable. Set aside on a separate plate. Preheat oven to 375 degrees and put the grate in the middle. Grease a large baking sheet and set next to you. Cut tortillas in half with a knife to make 18 pieces. Time to stuff! Line the tortilla so that the straight, cut edge is closest to you. Scoop a small amount of the sweet potato and black bean filling all along the edge– you only want a scant portion so you’re still able to roll and seal taquitos effectively– sprinkle with a little of the shredded cheese and then start to roll the taquito in, using your fingers to tuck it under making it as thin as possible. Set them onto the baking sheet with the sealed edge on the bottom and continue until all finished. Sprinkle with paprika and stick in the oven to bake until melty and golden, about 20-25 minutes. *Use corn tortillas instead of whole grain. Since these guys are smaller in size, you won’t have to cut them in half so just fry, fill, and roll. *Swap out the Mexican shredded cheese with crumbled feta or goat cheese for a tangier flava-flav. *Take out the spinach and replace with 1 cup sweet corn kernels for a Tex-Mex bite. *For a meatier alternative, try using 1 lb. ground turkey, browned and golden instead of sweet potatoes. Michelle - Welcome back from the land of lint. These look so, so good. Definitely worst dusting things off! fatpiginthemarket - Did you say Aji Colorado…my firey friend that you introduced me to? You know I’m going out to find the powdered form asap. The cream cheese sounds perfect for smoothing out the heat. Nice to see you back!